While we’re on the subject of my 3 year old being, well, “particular”, I’m going to let you in on the tug-of-war I’ve been having inside my head for the last few weeks. Owen is in the midst of a particularly difficult period. The mitten-based tantrums are one part, but he’s also been struggling to express his frustration in other situations. At school this shows up in uncharacteristically aggressive reactions to friends taking a toy from him, or teary meltdowns over things that didn’t use to bother him at all, like any answer to the question, “What are you makin’ for dinner?”. Being around him is a bit like walking a minefield. You never know when you’re going to step on a bomb. He didn’t used to be like this. It feels like it’s not really “him”, but I can’t get him to snap out of it. There are a lot of potential reasons why this behavior might be flaring up right now. 1. He’s 3 1/2. I remember reading somewhere that the “half-years” are often far more challenging than the time surrounding actual birthdays due to developmental leaps and struggles. I remember a chart of a spiral of child development that showed common behaviors for each year/half-year and the year behaviors were often “mastered” and the half-years were “developing”. And, on top of that, there’s the omnipresent dichotomy between being a baby and being a big kid — needing your parents while simultaneously wanting to do everything for yourself. Which is stressful for a kid. So there’s that. And to be honest, maybe I could just stop there. Because 3 1/2 is hard, no matter how you slice it. 2. Emmett. I know he’s been around for 5 1/2 months, but now he’s getting bigger, and cuter, and he’s beginning to do things that Owen does too (like eat food), which might make him seem more like a “threat” to Owen. I almost hesitate to add him to this list because Owen has never, not once, showed any frustration or anger or ill will towards him. He is the sweetest, kindest, gentlest big brother. Even more than I ever thought possible. His bad attitude has never been directed at Emmett. Still, I understand that realizing he is not the center of attention in our family all the time is a long and arduous process for Owen. 3. Increasing/high expectations. Owen recently night potty-training himself. His night pull-up had been dry for 5+ months, but I wasn’t going to pull the plug on the pull-ups just yet, as I’ve read that kids (boys especially) aren’t generally physically ready for night training until 5 or even later. I didn’t want to stress him out. As with the rest of our potty training journey, though, Owen was insistent, and once he decided he wanted to be dry all night, he was. So once we finished up the pull-ups we had in our house, we supported his decision to sleep in underwear. Boom. Done. In the mornings when his magic clock turns green, Owen LOVES getting up by himself, going pee, getting dressed for the day and coming in to our room. It’s glorious, and the best part is that he is so proud of himself. The kid can write letters and wipe his own nose and put his dishes in the sink and work the CD player on his own. He is so capable and eager that we just keep teaching and he just keeps learning. Accepting responsibility. Asking for it. But then sometimes he wants to go backwards. And NOT do all of those things. And it’s confusing for us, and sometimes we push him. “You’ve done it before”, “You know how”, “You’re a big boy”. 4. Illness. Acting out on the outside when he’s feeling bad on the inside has always been a common thread for Owen. It’s generally in retrospect that I can identify that an ear infection was to blame for his whiny tantrum or a brewing virus was behind a hitting rampage. Right before Christmas Owen had a nasty respiratory bug that coincided with the stomach bug. Then he seemed to get better. Then a few days later his fever resurfaced. He complained of stomach pains and a headache. I told myself I would take him to the doctor in the morning, but in the morning his temp was normal and he said he felt fine again. Then over the weekend his temp spiked again, all the way up to 102 even after a dose of Ibuprofen. Doc said if it was still high the next morning to come in. Next morning it was back to normal and he said he felt better. Since then no fever, but he’s still acting under the weather and complaining of his stomach. I know illness can’t account for bad behavior for months upon months, but it’s possible that there’s something going on health-wise that I just haven’t identified yet. And then of course there’s always the theory that bad behavior is a cry for attention. For love. And that’s probably also the case. Given that it has felt like these behaviors were getting worse recently, Benjamin and I scheduled a meeting with his teacher and the psychologist on staff at his school. She routinely visits the classrooms and knows the kids and I wanted to get her opinion (reassurance?) on if his behavior was normal or if she thought there was something bigger going on. The bottom line is that both his teacher and the psychologist feel that his behavior is well within the range of normal (which we were relieved to hear). He’s 3. It’s hard being 3. They both offered solutions for dealing with his behavior, many that I had heard before and that we already use on a daily basis (offer choices, give him power when possible, praise good behavior and don’t give attention to bad behavior, help him verbalize his feelings, etc.). The psychologist also talked a bit about hugging it out, or pulling him in rather than pushing him away when he’s acting out. It feels uncomfortable to say out loud, but that’s not my knee jerk reaction when my kid is acting like a wild animal. My usual response to that behavior is “I can’t hear you when you talk like that” or “I don’t want to listen to you cry. If you need to cry, go do it in the other room” or “Come back and talk to me when you’ve pulled yourself together”. It’s not necessarily pushing him away, but it’s a general avoidance of his emotional outbursts. To be honest, it’s treating him like an adult who has the capability to pull themselves together without help. Which a 3 year old doesn’t necessarily have. And, while we’re being honest… it’s not really helping. While shutting down and closing the door to him might feel like the right thing to do to me (“I’m teaching him a lesson!”), it might not be what he needs to get through it. The psychologist made a very strong case for the fact that, during these outbursts, Owen probably wants them to stop as much as I do. He wants to pull himself together. He wants to stop crying. He’s not manipulating me; he’s sad. And he needs help. And when she said it like that… well, then I just felt like a jerk. So we’ve been trying this tactic recently. Instead of walking away from his tantrum, I take a deep breath and hug him. I just hug. Eventually I talk softly and try to put words to what he’s feeling, but it starts with a hug. (Benjamin is way better at this than I am, but I’m working on it). It’s not all rainbows and unicorns — sometimes Owen REALLY doesn’t want to be hugged. Sometimes it backfires. Sometimes, even when it helps, I feel like I’ve giving attention to bad behavior and it will turn him into a spoiled brat. So I’m still figuring things out, like when and how to use this. And I’m still learning how to reconcile bringing him in vs. pushing him away. And to make it my instinct rather than something that’s difficult for me to do. But it certainly feels nice to have something in my parenting toolbox other than ignoring my kid until he can get his emotions under control. I hope those of you with little ones survived the sugar rush of Halloween yesterday. I am excited to share pictures with you from our trick-or-treating escapades, but we’re still in the process of downloading and editing. I’ll post as soon as they’re ready. In the meantime, though, I need your help. We’re having a bit of a challenge with Owen that we are struggling to address. He’s been having a bit of a rough patch with his behavior. Maybe it’s just being 3. Who knows. The so-called “terrible twos” were really not so terrible for Owen. Sure, some frustrating times and a little trouble learning how to use his words instead of his body, but nothing we couldn’t handle. In general he was a gem. Or maybe that’s just the wisdom of retrospection talking. Either way, we’re past those days. But this almost-3 1/2 stage is a whole different beast. I’m sure some of it has to do with Emmett joining our family (the bad behavior has emerged since Emmett turned 3 months, and, though I ignored them at the time, a few friends told me that it takes about 3 months for the “new baby” stuff to set in). 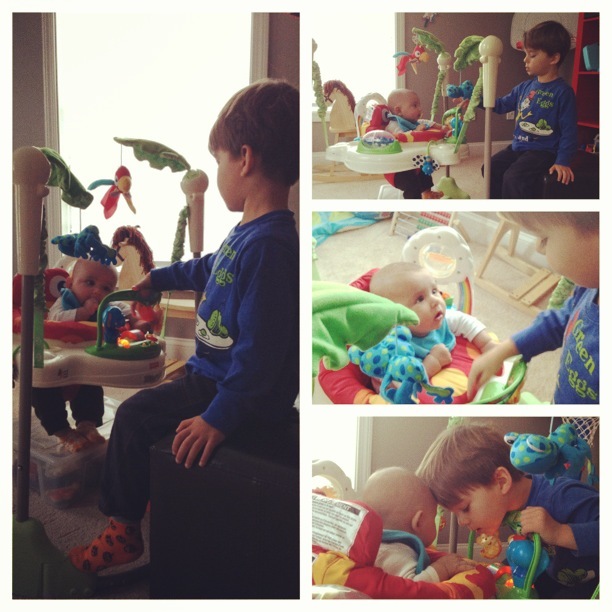 But in our day-to-day life Owen ADORES Emmett. None of the bad attitude is directed at Emmett and he’s never verbalized anything about not getting enough attention or wanting to take Emmett back to the baby factory. In fact, Emmett is almost always the key to getting him to snap out of his bad attitude. Owen showers him with love, teaches him, talks to him and is remarkably gentle whenever we’re all together. Still, the psychologist in me knows that this huge shift has to have impacted him in some way. Some of it likely has to do with just general growing up. He’s in preschool now and he has a lot more “responsibilities”. We expect a lot of him. He’s wearing underwear all the time. He is beginning to question some of the rules he has blindly followed for so long. He is smart enough to see through our language to the truth of what we’re saying even when we sugar coat it. Too smart at times, it seems. And I think some of it comes from watching (and imitating) his peers like a hawk. Sometimes he’ll come home from school with a new phrase or a not-so-nice name to call someone and I’ll ask him, “Where did you hear that?”. So-and-so said it at school. He’s started getting up out of bed at night since he saw his little buddy doing that on our trip to New Hampshire last weekend. He’s figuring out how to push buttons or get a reaction, and he’ll copy behaviors he sees others doing to a T, for better or for worse. He’s started talking back in a bratty tone of voice. “Nnnnnno!”, he’ll yell. “STOP IT, MOMMY”, he retorts when I tell him that’s not how we talk in our house. He demands things “now” and throws surprisingly emotional fits when I tell him that’s not a nice way to ask and I’m not going to give it to him until he asks politely in a non-whiny voice. His lifelong issue of “gentle hands” flares up when he’s angry as well. He throws things out of frustration. Pushes. Smacks my body. He’s just not listening the way he used to. He’s testing. ALL THE TIME testing. Benjamin and I are standing our ground. Not giving in. I feel like we’re reacting the way we “should” but sometimes it feels like it snowballs until we’re all exasperated and angry (not to mention that I would prefer to just be rather than teaching lessons all day long). In general I’m really good at staying quiet and calm while he tornadoes around me, but it’s hard. It’s HARD. We do give time-outs when warranted, but I try to save them for behavior that could hurt someone’s body (either his or someone else’s). Generally I’m a punishment-fits-the-crime sort of person (oh, you threw a toy? the toy gets taken away) and prefer positive reinforcement and rewards to punishment or taking things away. We’re all learning, right? But I’m at a bit of a loss when it comes to the verbal attacks and general not listening he’s doing now. Time-outs and rest-your-body times are pretty powerless against vocal infractions or just not following directions. He can still yell and scream and cry even if his body is in time out (that’s why I usually save that tool for when his body needs calming). There isn’t a toy to take away or a logical punishment. I can’t yell back (or of course I shouldn’t), and it wouldn’t help anyway. I just want him to hear my voice (or his teacher’s!) and do what I’m asking him to do without saying “but” or “I don’t want to”. And it’s not just at home either. His teachers have noticed it at school as well. And while it’s all incredibly, totally, positively age-appropriate, we don’t want to let it spiral out of hand. So we had a meeting yesterday to discuss potential strategies for helping him through this rough patch. We currently use a sticker chart for “good days” at school. In the past this meant keeping his hands to himself and recently it has been expanded to listening to his teachers as well. Over the last few months this has worked brilliantly. Stickers have amazing powers over the 2-3 year old set. Over the last few weeks, though, he hasn’t gotten very many stickers and it seems like not getting stickers breeds more not getting stickers. We may stick with it or may institute another positive tool like putting pompoms in a jar for good listening or nice words/attitude. Has anyone instituted something like this at home? I put it in a picture frame so he can use a whiteboard marker and check off when he’s done each thing. Each night we’ll wipe it off and start again the next morning. Our intention is that we will essentially leave him alone to do all of the morning steps, and hopefully at night it will help us get from flossing to brushing to bath to pajamas without fussing in between. I’m hoping the physical act of using the marker will help move us between steps and will also act as a little reward (hey, we all like checking things off of our To Do lists, right?). What are your tricks for helping your little person do the things they need to do without a lot of reprimanding on your part? Don’t get me wrong, Owen is still SUCH an awesome kid. Most of the time he listens and responds in hilarious and adorable ways. Most of the time he is in control of his body and is so much fun to hang out with. Most of the time he is sweet and funny and precious. It’s just the other times that I’m learning how to react to in the best way. The last few days have been long. In retrospect, I think Owen was dealing with an ear infection that flew under the radar, but at the time all I saw was aggressive behavior at home and at school, general fussiness and a lot of “NO!”. I even attempted to institute our first (second?) “real” time-out after he threw a little stool in anger, a la 1-2-3 Magic. I say attempted because although in the end he did sit for a few seconds, it was preceded by a lot of laughing in my face and trying to escape and overall not really understanding why he was sitting on the stairs. There’s work to be done there, but that’s a whole different post. Amidst the rough behavior, he’s been rocking the underwear at home (both over the weekend and every night when he gets home from school), so I think this actually may stick. And speaking of school, it’s report card time again! Ok, ok, Developmental Report. It’s not grading him on how smart he is, but rather placing him on a continuum from “Accomplished” to “Requires Support” on a variety of different skills. I am always so intrigued to get these reports from his school because they are very detailed, and they help give me a sense of how he is developing in comparison to his peers (since he’s my only kid so far, I really have nothing to compare him to except himself). And, although every parent would like their child to be perfect in every area, I’m also interested to see which skills he is lagging behind on so I can keep an eye out for ways to practice them at home. Owen is all over the map in this area (as I imagine many 2 year olds would be). Though he is “accomplished” in a lot of areas, he still needs quite a bit of help comforting himself when he is upset and controlling his own frustrations in a non-aggressive way (see above with the stool throwing incident!). Owen has been a super social kid since the day he was born, and that hasn’t changed much. He’s very outgoing and from what his teachers tell me, he’s always anxious to yell out answers and participate in activities. He knows everyone at school by name, and even knows many of his friends’ parents’ names too. He still has a ways to go with following group expectations like taking turns and listening when others are talking, but I’m going to guess most of those issues come from being an only child and coming from a long line of attention hogs/loudmouths. These skills are where Owen really excels. His teachers noted that he loves to engage any adult (or peer) in conversation and loves to tell stories. Future actor? Comedian? Who knows, but I know the kid loves to talk! This was an area where Owen was marked as “progressing” for many skills on his last progress report. It was definitely helpful to hear this, as it reminded me to ask him to do some of these things himself rather than doing them for him when he was 18 months – 2 years. Now he’s quite good at taking off/putting on his coat and hat (recently mastered “the flip trick” and now wants to show anyone who will watch him put his coat on), and last night he even demonstrated he could do pants too. Progress! I post these not because most of you really care how Owen scores on these individual skills, but because I find the lists of what this age group “should” be doing really interesting. If he wasn’t at this particular daycare, I wouldn’t have any clue about asking him to try some of these things, so I thought I’d share! It’s no secret that Owen has some issues with using gentle hands (even when it comes from a place of love… remember his issues with over-hugging here and here?). Mostly with his friends at school, but Benjamin, Schnitzel and I are not immune to it at home either. Nothing out of the ordinary for a two year old, but I knew even when he was in the womb that he was going to be a very active kid. A very physical kid. A motor-driven, kinesthetic learner. He is also sweet and gentle and hilarious and silly and insanely smart and emotionally intelligent… it’s part of the whole package, so I’ll take it. Sometimes I think he just forgets that kicking and smacking and pushing are NOT OK. The past few weeks have been riddled with stories from daycare that Owen had to be reminded to use gentle hands with his friends (and one teacher). On Wednesday we even had to sign an official “incident report” because Owen hit a friend across the face with a toy he had just grabbed from him and it really hurt him. Oy. I’ve discussed each situation with the teachers and they don’t think it’s anything out of the ordinary, Owen is just a rough kid who doesn’t realize his own strength and who is still working on communicating emotions with words rather than actions. He is beginning to understand the cause-and-effect of hitting a friend = tears = teacher comforting the other friend = it was his fault and he should make sure the friend is ok. Sort of. It’s beginning to sink in. The past few weeks have also been riddled with illness and ear infections and schedule changes and holidays and too much family and not enough sleep… and I know from experience that these outbursts usually happen when Owen’s own body is in pain. So I get where it’s coming from. Sort of. I’m trying to get where it’s coming from. The last few days I’ve tried a “reminder” system. We “remind” Owen at drop-off in the morning that we really want to hear a good report from his teacher that he used gentle hands all day, with everyone. It has had spotty results. (Read: relatively ineffective, despite the enthusiastic nodding we get from Owen in the morning). So today we’re instituting something new. A sticker chart. If I had enough free time I would create you a cutesy printable, but I’m at work today scrambling to catch up from the holidays, so I did a quick Google and found some pretty cute, free, downloadable ones at stickersandcharts.com. I printed the smiley one and the dinosaur one and I’m going to let Owen choose which one he’d like to be his “Gentle Hands Chart”. Let’s see if this does the trick. He seemed pretty excited about the idea this morning, so we’ll see if a sticker is incentive enough to keep him from manhandling/accosting his classmates and teachers. Have sticker charts worked for you/your kid(s) in the past? What else works as incentive? Any tips for instituting this? You guys are amazing. Thank each and every one of you for your incredibly thoughtful comments on yesterday’s post about using lovey as a discipline tool. I still haven’t figured out threaded comments in the WordPress template I use (that, along with about a zillion other things, is on my “when I have a free 15 minutes” list), and replying to all of you in one big comment wasn’t going to be complicated and disorganize. Not to mention that so many people wrote their comments anonymously, so you wouldn’t know who I was talking to. So I decided to write out my response/thanks here, in a separate post. A lot of your comments said something like “I understand where you’re coming from, but what the teacher did was totally ok. It’s just hard to see your kid disciplined by someone else”. You are so, so right. It is clear to me, after thinking it over for a few days and reading your very helpful comments that seeing this situation through the Mom lens tacked on a lot of emotion and baggage when really, what happened was totally ok. I still plan to have a quick chat with the teacher and ask a few more questions about what happened (since I only got a quick version of the story at pickup). If I really don’t want her to use withholding lovey as a technique unless it’s absolutely necessary, or would like her to try other techniques first when possible, I will say something then. I trust his school and his teachers, and have always, always respected their approach. Even though this situation caught me by surprise, I can see the philosophy behind it and I know that it was done with love. I said yesterday that neither school nor I have instituted time outs so far. That doesn’t mean we never will! In fact, I can see we are getting there. It’s just that, until now, we haven’t really needed to, as we have employed different techniques. I’m certainly not against them; in fact I think they are very effective when used properly! Just as Owen is testing his boundaries and pushing my limits, I am testing out which techniques work for me and my family. It’s all a learning experience and I’m constantly refining my approach for my specific child in this specific stage of his life. Perhaps those weren’t the best words (since “abuse” and “teacher” shouldn’t be used in the same sentence!). I didn’t mean to say that it WAS an abuse of power; I was asking readers if THEY thought it was. In fact, I hope it was pretty clear from my language that I was more questioning if withholding lovey was an appropriate tool for leverage, considering Owen’s emotional ties to it, and the fact that, as a 2 year old, Owen still needs some help soothing himself when he is overtired or upset. This morning at drop-off I reminded Owen, in front of his teacher, that when his teacher says it’s time to change his diaper, that it’s time to change his diaper, and he needs to listen. I didn’t add anything about the consequence or discuss screeching, but showed my support for “the teacher is in charge when you’re at school” and left it at that. I’m happy to put this one behind us and move on, hopefully without any more screeching. Now to fit in a full day of work and get my entire house sparkling clean before family arrives for Thanksgiving! Ready… set… GO. She Says… Abuse of Power or Good Idea? Friends, I need your help/wisdom. I’m having a bit of a dilemma. Before I tell you the situation I have to say up front that we ADORE Owen’s school. Everyone from the administrators to the teachers to the assistants to the parents have been wonderful. This dilemma is NOT a criticism of the school or intended as finger-pointing. In fact, the school has been incredibly helpful in understanding and dealing with tons of other regular old toddler issues that could be problematic (aka BITING). I love their philosophy and I appreciate their tendency toward positive reinforcement rather than negative punishments, and letting kids explore the world around them as much as possible without limiting them. Over the last few weeks Owen has started a new (highly annoying but very normal) behavior. Screeching. Oh, screeching such that only dogs should be able to hear. Except people can, too, and it’s excruciating. I actually think this is a healthy development, because it seems to be taking the place of hitting/punching/pushing/biting when Owen is frustrated or not feeling heard. So I’m pumped he is beginning to figure out how to regulate his body and let his emotions out through his voice. However, not surprisingly, this screeching gets a rise out of people VERY quickly (I, for one, absolutely cannot stand it and despite my best intentions to ignore, redirect, discuss, etc., it just snaps me), so he learned really quickly that it is an effective technique. At least to get attention, if not exactly what you want. (Not from me, mind you. I may yell over his screaming, which is not my finest moment, but I never cave to screaming. Ever.). At home, he usually does one really loud screech, gets a serious look from me, and he quiets immediately. Then we talk. It hasn’t been a huge issue at home. He gets that it’s not ok, and I only hear it VERY rarely. But apparently at school, screeching is, like many bad behaviors, contagious. So he screeches and someone else screeches and before the teachers can do a damn thing about it, they’ve got 10 little toddlers screeching their heads off. I get why this is a problem. Believe me. I do. That, of course, made him angrier/more upset, so he screeched some more (likely because he could tell it was making her frustrated and because he knew she couldn’t actually stop him). Eventually he stopped, got his lovey, and fell fast asleep. When the teacher told me the story at the end of the day, I almost cried right there in front of her. I don’t know why it felt so personal to me, but the thought of withholding Owen’s lovey… the one thing we have taught him to use as a tool for self-soothing and self-calming, seemed like an abuse of power to me. It hurt my heart to think of him crying for his lovey and screeching because he couldn’t find the words to tell her what he needed. (Side note: Lovey stays in Owen’s crib or nap bag at school all the time — he’s never used as a soother when it’s not naptime or bedtime, but I have never, not since the first time Owen slept with him, taken him away or threatened to do so). I know she didn’t mean it like that. I know she was likely grasping at straws and trying to think of a bargaining technique that would make him stop screeching so everyone could nap. But I also know that it was minutes before naptime, on a Friday, after a long week of school. He was exhausted and probably teetering on the edge of that overtired cliff that has always been the root cause of the few and far between tantrums I have ever seen from my little guy, who is usually cool as a cucumber. So as she told me the story I just nodded and thanked her for letting me know, and talked with Owen about how screeching inside is not ok. And that he needs to listen to his teachers. End of story. After thinking about this all weekend (literally, it has kept me up at night), I’m certain that I need to have a discussion with the teacher tomorrow to let her know that I would rather she not use lovey as leverage. However, I feel that I need to offer her another suggestion of how to deal with this screeching or when Owen isn’t listening. I can’t just say “don’t do this, but I don’t have a solution”. Neither school nor I have instituted time-outs so far. He’s two. I try to “honor the impulse” and understand that almost everything he’s doing is exploring and testing. It’s exactly what he should be doing, and, in my opinion, ruling with an iron fist will only add a lot of stress to both of our lives at this point. That said, I have started to direct him to “go in the other room and calm your body” and “let me know when you’re ready to try again without screeching”. So, what would you do? Do you think using lovey was an ok way to show Owen that screeching is NOT ok? Am I overreacting? Can you think of a way that his teacher could positively reinforce NOT screeching rather than punishing screeching? Or do you think it’s worth disciplining now so that it doesn’t become a bigger issue? Last night I reached my limit of Owen’s screams of “No Daddy”. I just… couldn’t hear it anymore. And I didn’t even know how to react anymore. The behavior was making Benjamin sad, me angry and Owen throw tearful fits at something completely inevitable. So I made a new rule. No more “No Daddy”ing. Generally I’m all for putting emotions into words and Owen expressing himself and letting him dictate what he can during his day. But this Anti-Daddy campaign has gone on long enough. And now I fear that it is being used as a tool to get what he wants (me) ALL OF THE TIME. Starting last night, no one in our house is allowed to say “No Daddy”. Last night after dinner I offered to do the dishes while Benjamin and Owen played upstairs together. Usually it’s the other way around, but I could tell that Benjamin needed some Owen time and Owen needed to see that he can’t just boss us around. And guess what… they had fun! Yes, Owen spent about half of the time whining for me, but when he realized I wasn’t coming every time he scrunched up his face and wailed, he settled. Today is an all-Daddy day and I am at the office. This morning when Owen tried his first “No Daddy” I shut it down immediately, and from then on things seemed to be good. So maybe Owen just wanted to see how far he could push the Anti-Daddy Campaign before there were limits. Now that there are limits, I think we’re good. Phew. Rough week. Let’s hope we’re back to normal starting tomorrow morning! We have a fun weekend planned starting with a breakfast date with Owen’s best buddies at school and an afternoon playground date with one of my mom group friends who I met when our babies were only 12 weeks old. I’ll tire the ‘tude out of Owen, if nothing else. Rationally, I knew this day would come, in some form or fashion. By the time they’re in preschool, most children have bitten someone at least once, as well as been on the receiving end of an unfriendly chomp. I mean, toddlers are toddlers. They get frustrated. They push and hit and… bite. And it’s not mean or aggressive or bullying. It’s just toddlers being toddlers. But emotionally, when the day came (TODAY! ), I was unprepared. I felt irrationally guilty (that MY child hurt someone else) and shocked (that my sweet little cuddler could lash out in such an aggressive way) and sad (both for him, that he was so frustrated he felt the urge to bite, and for the little person he chomped down on). Owen’s teacher: Hi, Kate. I wanted to let you know we just had a little incident at school today. Me: Ah, ok. Another one? (I was thinking we were talking about Owen jumping off of something or running into a counter and getting a big bruise or a bloody lip, like the calls I’ve gotten in the past. The kid is a bruiser.) What happened? Teacher: Well, Owen bit one of his friends today. Me: He did what?! He BIT them?! He has never bitten at home before. Umm, I’m so… sorry… what happened? Teacher: Owen was playing in the play kitchen with a friend and he wanted to use the sink. He tried pushing the friend to move them out of the way, and when they didn’t move, he bit them. Me: Oh my goodness! What do you do, in that situation? Teacher: We treated it the same as if he had hit someone. We lovingly let him know that biting was not ok, and that he hurt his friend. We acknowledged what he wanted to be doing (“I see that you are frustrated because you want to use the sink”) and offered him words to explain his frustration, rather than actions. He comforted the friend with us and could tell they were sad because of what he had done. 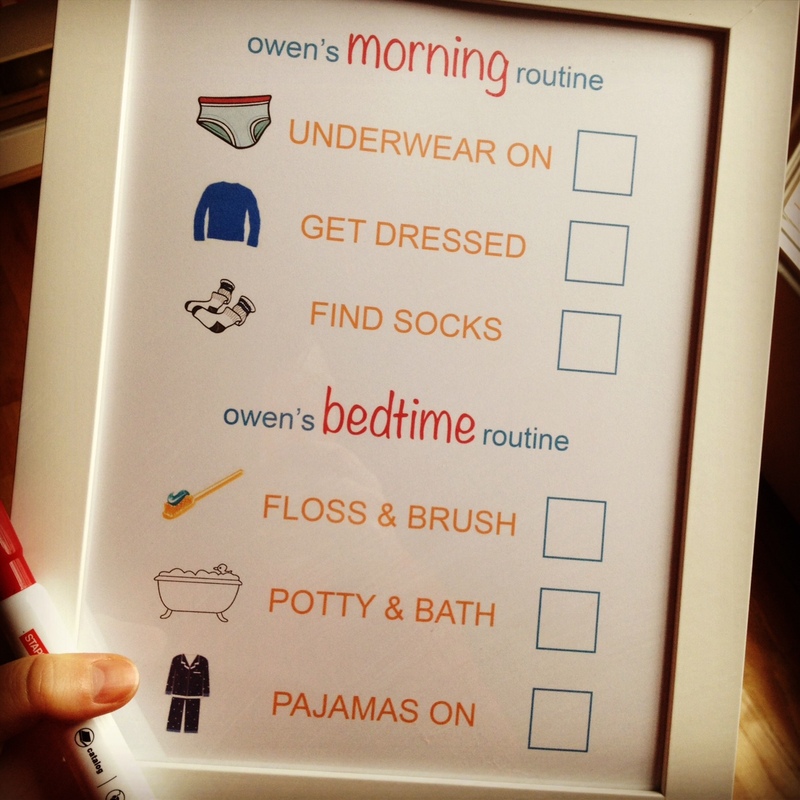 It’s completely developmentally appropriate and is something we will continue to work on with Owen and his friends. We went on to discuss tactics we can use at home to curb this behavior and help him express his frustration with words rather than actions. Despite knowing how normal this is, man, I felt overwhelmingly guilty. So MY KID is the biter. I didn’t really know how to react. When I called Benjamin after hanging up the phone with Owen’s teacher, I couldn’t stop laughing. I don’t know, maybe it’s like laughing at a funeral. I felt emotional about what had happened, but I wasn’t really sure what I was supposed to do. So I laughed. Many preschoolers bite once, get help with it, and never do it again. This article has some great suggestions on how to react when your kid is the biter. One thing I can definitely do immediately is stop “play biting” at home. When I’m putting Owen in his pajamas at night, I often play at biting his feet and “eating” him all up. He thinks it’s hilarious. He giggles until he can barely breathe. He’ll often ask for my elbow (he thinks elbows are hilarious too) and pretend to bite it. I pull it away, mostly out of fear that he might actually bite me, but it has turned into a game. And Lord knows he bites when we floss his teeth. But this article (and a particularly hilarious Modern Family episode) notes that even play biting can encourage kids to bite in other situations. See? Guilt. “I did this to him!”. We’re going to work on it. While I know biting is not ok and is something to address with Owen in a variety of ways, I can also see, quite clearly, that it is just misplaced emotions. Here’s hoping we can get those emotions expressed in different ways, though. I don’t want to raise a bully! Has your child acted aggressively toward another child? What did you do? What did the other child’s parent do? Generally I tend to be more in the “leave kids alone to figure out how to work things out” camp, instead of intervening at every turn. However, when hitting and biting are involved, I think I need to take a stronger approach.